If you had financial difficulties in the past and had to file for bankruptcy, some auto dealerships won't give you a loan. Not here, at Need A Car Loan Now we can help you get you into the car you want with a loan from one of our preferred lenders. Our simple and secure online process allows you to complete and submit a Credit Application directly to our financial representatives. Once your information is received and reviewed, we forward it to the appropriate lenders. We have great relationships with many lenders because we have been financing loans for many years. This means we have advantages and financial opportunities other dealerships can't offer. We will work with lenders to get you approved at the lowest possible rate, even with a bankruptcy on your credit history. Within 24 hours you will receive a detailed loan approval from which you can calculate the payment that is right for you. Use our online Car Loan Calculator to determine what you can afford based on your monthly bills and your approval details. The most important thing to remember when calculating a payment is that it stays within your budget. By consistently making your payments on time, lenders can see that you are improving your credit. Once they see that, they are more likely to offer you a lower interest rate on your car loan. Once you have everything calculated and been approved we wills chedule an appointment to select your new vehicle. We have all makes and models available. We sell great pre-owned cars, trucks, and SUVs and have access hundreds of vehicles ensuring you can find the car you have been dreaming of. 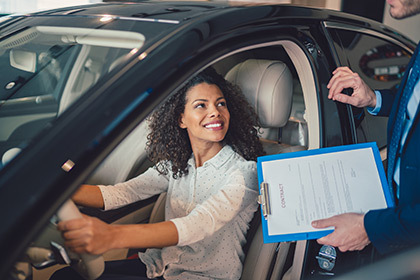 Our financial experts can help you better understand your credit and the loan you have been approved for, and our sales professionals are ready to help find the car that's right for you.